Erin Hanson creates vibrant and inspiring landscapes in her signature modern blend of classic impressionism and expressionism, which is becoming well known as "Open Impressionism." 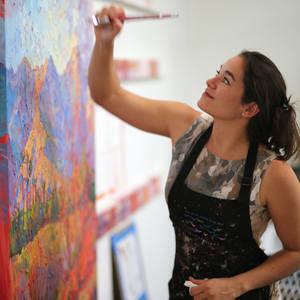 A bold impasto paint style breathes life into her colorful large wrap canvases. Raised in the Southern California desert, Hanson's thirst for adventure and love for art has been evident from a young age. First painting in oils on a easel constructed by her father while in elementary school, Hanson has rapidly emerged as a must-watch artist for art and nature lovers worldwide.